GreenWood Resources recently completed the sale of the 25,000-acre Boardman Poplar Farm in eastern Oregon that it has managed over the past eight years on behalf of the owners of the GreenWood Tree Farm investment fund. The fund owners voted to accept unsolicited offers from a dairy and an agricultural venture to acquire separate parcels of the farm. GreenWood Resources and ZeaChem, both of whom are AHB industry partners with operations in Boardman, agree that the transition of the poplar farm will have a minor impact on the AHB program. Actually, GreenWood Resources sees the sale as strengthening the argument for purpose-grown poplar biomass farms, especially when they are integrated into energy companies that require dedicated tree plantations as a component of their feedstock supply portfolios to secure capital investments. Poplar residual supplies alone are unlikely to support the extraordinary biomass volumes that will be needed to produce bio-fuels and bio-products. The key remaining challenge is developing supply chains where both plantation owners and bio-refinery operators can generate adequate risk-adjusted returns. The tree farm lands were much sought-after by farming interests for several reasons. For dairying, the farm is strategically situated near the Tillamook Cheese Boardman production facility. For high-value, annual row cropping, the farm’s proximity to the food processing industry at the Boardman Industrial Park (Lamb Weston, Oregon Potato, and Boardman Foods) and the Park’s rail and barge terminals are of exceptional value. But perhaps the strongest attraction was the farm’s senior water rights to the reliable reservoirs of the Columbia River. 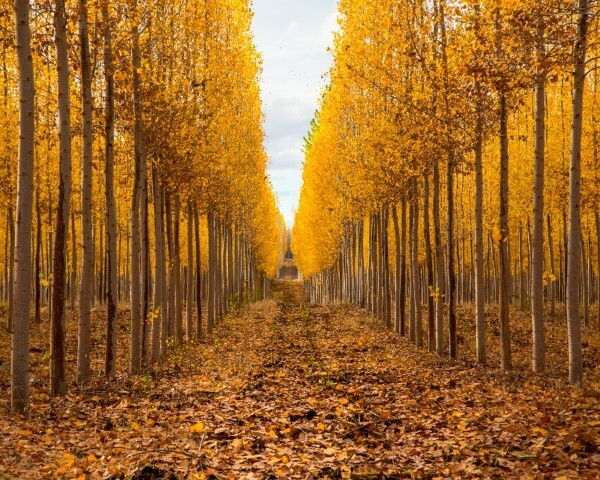 A poplar stand at the GreenWood Boardman Poplar Farm in Oregon. The farm produced 30,000 board feet per acre of sawn wood products on 12-year rotations. This volume marketed as Pacific Albus© for the appearance grade hardwood lumber market; veneer sheets and pulp chips were also produced from the residual volume. However, unfavorable current pricing and market trends figured in the investor’s eventual decision. AHB’s conversion partner, ZeaChem still plans to build a commercial cellulosic ethanol refinery in Boardman. The transition back to conventional agriculture and dairying will take a period of years during which GreenWood will continue to harvest the poplars as they reach rotation, operate the Boardman saw mill, supply veneer logs to the Columbia Forest Products facility, and sell chips to area pulp mills and biomass to the refinery. GreenWood Resources continues to operate and harvest AHB poplar demonstration farms in Idaho, Oregon, Washington, and California that show good promise for feedstock production. Mean annual increments during the second, coppice cutting cycle are expected to vary between 5 and 7 dry tons per-acre, per-year dependent on location and plantation variety. From each ton of poplar biomass, over 1,200 pounds of sugar are recovered for alcohol production following pre-treatment. A breakthrough in ethylene oligomerization has brought the process of converting alcohols into hydrocarbon fuels closer to the commercial production. While not competitive given current petroleum prices and the limited financial benefits of low carbon fuels, the AHB process of growing biomass and converting it to renewable fuels is well positioned to grow the Pacific Northwest’s future bio-economy.